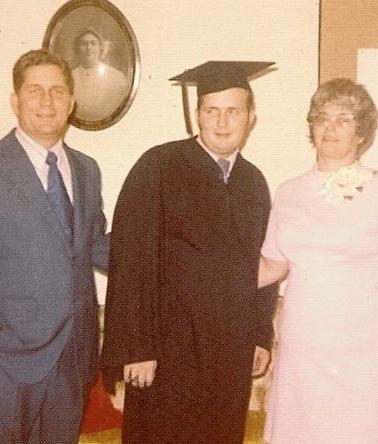 Me graduating, a long time ago. This was the year of the “great pandemic”. Or at least the year the university where I teach postponed graduation. Almost 200 students came down with a virus the week leading up to exams, and, perhaps with a little shove from the health department, the administration moved graduation back a week, to “clear the air” so to speak. This is, of course, a public relations nightmare. Lots of families and even graduates from our external or online programs had bought plane tickets. Other students were starting new jobs, getting married, or traveling over seas. But more than that, many students who had visualized themselves walking across a stage to commemorate the achievement were giving up a dream, and not all of them were happy about it. One program, with many international students, had a commencement service of their own, off campus. About 30 students met outside at a nearby park to mark the day, joined by a few family members huddled in the rain. Others just moved on, to the next thing. Celebrate. Your family has put a lot into this, both emotionally and probably financially. So go out to dinner or have a pot luck or cook out. Tell stories. Laugh a lot. A commencement is a lot like a wedding, just as much for family and guests as it is for the bride or groom, or in this case, graduate. So make a speech (it’s one of the things you learned how to do) and welcome them into your new journey. While you are at it, you will want to say thanks, of course. But some of the people you want to thank aren’t around. So buy a box of actual note cards and write a few friends and faculty—thanking them for specific contributions to your achievement. This is too important for Facebook. A card will cement lifelong relationships and be remembered, even treasured, more than any hug you might have exchanged at commencement. You didn’t get here by yourself. And you don’t need a ceremony to say so. Contemplate. Seriously, you would probably not have remembered whatever challenge a commencement speaker may have offered. But you should create one or more of your own. There are new habits to be developed, weaknesses to overcome, contributions to make. Don’t miss the opportunity to reflect. So pause, reflect, consider. We taught you how to do that too. Or tried to. Consecrate. To guard our heart is a life-long discipline. But it leads to action. So make a list. Have a plan. Get out of the house and do something. The temptation to take it easy is great. It’s hard not to feel you are entitled to a break. But you are to walk worthy of the vocation to which you are called. And it has nothing to do with a job. So even if you are waiting for a job, find something to do, at home, at church, in the community. The investment you and others have made to get you to this point is enormous. Be gracious and intentional about paying it back. You have a few months before the loans come due. But your most important obligations have begun. The stakes are higher, the responsibilities greater, the opportunities innumerable. So set your face like a flint toward the sacrifices you were born to make. I’m sorry many of you will missed the moment you anticipated. But celebrating, contemplating and consecrating don’t require a gymnasium filled with strangers. Graduation is only an exercise, after all. But commencement is fresh start. “Your family has put a lot into this, both emotionally and probably financially. So go out to dinner or have a pot luck or cook out. Tell stories. Laugh a lot.” We did all this and more as each of my girls graduated from our little home academy. The families of home-taught high schoolers have become quite creative about alternate graduation exercises. We are looking forward to our daughter’s graduation from college next year. Words of wisdom here. I especially liked the part about the note cards. I had already been thinking of writing notes to all of the professors/instructors that have been so influential and encourging to our daughter. Our daughter missed out on her homeschool graduation ceremony as we had moved out of state just prior to it. She is very much looking forward to her college commencement ceremonies. We are planning on making this one a grand celebration. The wise words to “contemplate” and “consecrate” are good reminders to focus on what is most important here. But they all look happy. They’re laughing.